With so many iPod speaker docks on the market today, it’s hard to choose between them all. If you’re looking for an ultra-slim, ultra-cool and ultra-modern iPod speaker system, then the Kensington SX2000 is the ideal buddy for you. I’ve spent the best part of two weeks using the SX2000 in the office and bedroom and what really amazes me is how slim the whole unit is. 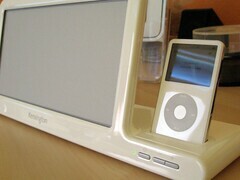 Measuring in at 16.2 x 7.2 x 3.9 (W, H, D) inches, this is arguably the slimmest iPod speaker system for the iPod. Employing the use of NXTs advanced SurfaceSound flat panel speaker technology, they’re able to pack a real punch when it comes to volume and sound quality. Truly amazing and when you listen to the sound that comes out of this system, it fills you with a thrill because the design is so simple and yet the sound is so powerful that it completely belies the complexity of the workings behind the speakers. 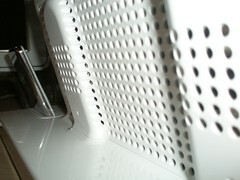 With iPod simplicity stylings and an all iPod-white case, the speakers fit perfectly with your iPod. I’m glad I got the white version as the black iPod would probably look a bit out of place. This is a problem that many iPod speaker manufacturers face and a problem that Apple has nicely created for them. The clever technology behind this allows for bi-directional sound. From my understanding of the technology, there exists two parts to the speaker. The exciter converts the electrical signals from the audio device and produces bending waves through the flat panel. The bending waves generate acoustic waves which travel through the air. You can start to find this technology in Hi-Fi systems and even cars; I distinctly recall seeing a Hitachi stereo system employing similar technology. The bi-directional sound means you can hear the audio from any point in the room whether it be behind the speakers or in front of it. The 1-inch thick design complements any bedside table, office desk, living room or coffee table. The modern, simplistic design is as elegant as the iPod itself; it really is that good. You’re probably wondering what the sound quality is like. I can say with confidence that it’s truly breath-taking. Unlike your typical speaker technology that you get in say the iPod Hi-Fi; you don’t get that low electrical hum in the background. Doesn’t matter how high you put the volume, the sound does not distort. You get a nice smooth sound that has a sufficient amount of Bass in the background which again is a bonus. Naturally you can’t expect a big booming bass sound coming from these set of speakers. It just won’t happen due to limitations in the technology. But don’t mistake this for tinny sound. It’s far from it. Listening to these speakers at high volume will allow for unbelievable room-filling sound. These speakers really pack a punch but suffice to say, I don’t think that’s what they were designed for. My time spent with this iPod speaker dock has been mostly as a bedroom speaker system. It sits nicely on my bedside cabinet and because it doesn’t emit any electrical humming noises or draw a lot of power, I’m able to use it as an alarm clock too! The iPod has a wake up timer function and you can select a play list for it to play when it’s activated. Simply leave the speakers switched on and at a decent volume before you snooze and the next morning, your favourite tunes will be waking you up. It’s refreshing to hear something other than a constant beeping noise and makes getting up in the mornings just that bit easier. 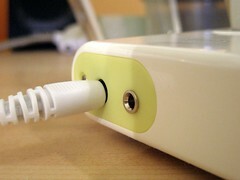 Universal docking ports come with it so that you can fit any sized iPod in to these speakers. If you change your mp3 player or you have another audio feed that you want to play, then the Line In at the rear will help you along with that. The SX2000 is powered by mains only and charges your iPod at the same time. The front interface has just three simple buttons; power, volume up and down. So look no further. Go buy a set of these speakers. You can find them for about Â£80 if you look around. 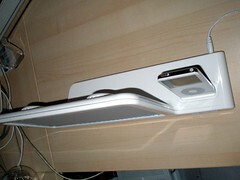 It’s the perfect bedroom or office accessory for your iPod and you won’t be dissatisfied with the quality of the sound. The Kensington SX2000 speakers won’t replace your high end audio equipment but it will certainly be the best solution for the bedroom or office. Its simple design and compact form factor makes it one of the best slim-line iPod speaker dock that I’ve seen so far. This product is definitely TechCast Recommended.